On-page search engine optimization refers to procedures that are performed on the HTML code of a Web site to increase the probability of that site's pages ranking higher in the natural listings for related keyword searches. On-page optimization of a site is the starting point for any search engine promotion campaign that targets natural listings and/or sponsored listings. It is distinguished from off-page search engine promotion. 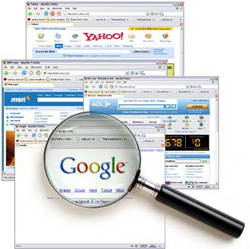 Off-page search engine promotion techniques generally refer to activities such as directory submissions, article marketing, and press releases which help build a site's link popularity. The elements below are factors that we address in our on-page search engine optimization services for obtaining higher rankings in Google, Yahoo, MSN, etc. The optimization of these elements does not guarantee high rankings for any targeted keyword phrase, but it does provide a solid basis on which to start a search engine marketing campaign. One of the most important factors that could enhance the search engine rankings for your website is the inclusion of targeted keyword phrases that reflect the actual content of your site's pages in the HTML < title > tag of your pages. We research and identify targeted keyword phrases and then arrange those keyword phrases in the HTML < title > tag of your site's pages in a manner that will yield the best possible results. To improve this factor, we include keyword phrases in specific HTML heading tags in order to increase the prominence of certain important key phrases so that they are noticed by the search engine crawlers. This factor refers to the inclusion of targeted keyword phrases in the body of a page and the number of times those phrases are repeated in that same page. The objective is to increase the relevancy of the textual information that is present on a page with reference to the keyword phrases that a prospective visitor might type into a search engine. It is achieved by maintaining a certain amount of keyword phrases in the web page. These are elements of a page that provide a description that includes targeted key phrases. Meta tags are inserted into a Web page’s HTML code, and they are are essentially meant to attract the attention of search engine crawlers to indicate and highlight the content about which the page promises to provide information. Images not only help in displaying information in an appealing manner, but they also grab and hold visitors' attention. Since they form such an integral aspect of the content present on your website, it is absolutely essential to optimize them with the key phrases pertaining to your site, and use them to work towards getting you a better ranking on search engines like Google, Yahoo, MSN, etc. This is a two-pronged exercise, which on one-hand helps the search engines spiders to crawl through the information present on a certain page to another, and on the other hand it helps the user navigate back-and-forth on the pages, looking for the information of their interest. It is a yet another excellent way to retain the visitors for a longer period of time and increase the chances that they will contact you.